The definition of a day is the amount of time it takes an astronomical object to complete one full spin on its axis. 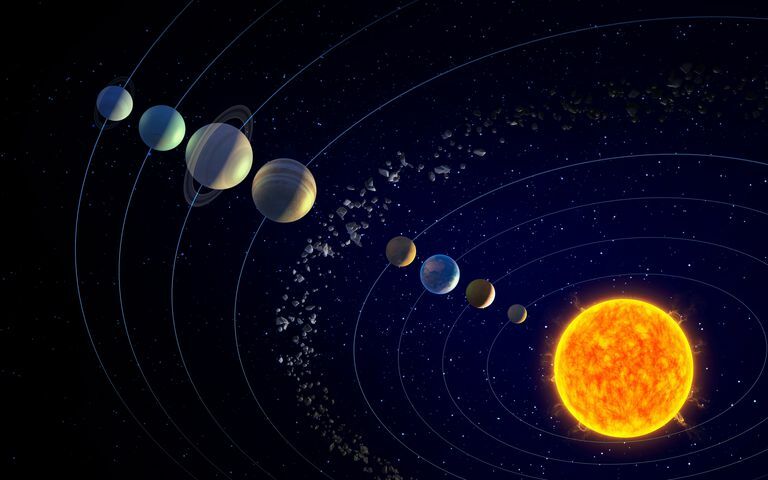 On Earth, a day is 23 hours and 56 minutes, but other planets and bodies rotate at different rates. The Moon, for example, spins on its axis once every 29.5 days. That means future lunar inhabitants will have to get used to a sunlight "day" that lasts for about 14 Earth days and a "night" that lasts about the same time. Scientists typically measure days on other planets and astronomical objects in reference to Earth's day. This standard is applied across the solar system to avoid confusion when discussing events that occur on those worlds. However, each celestial body's day is a different length, whether it's a planet, moon, or asteroid. If it turns on its axis, it has a "day and night" cycle. The following table depicts the day lengths of the planets in the Solar System. The planet Mercury takes 58.6 Earth days to spin once on its axis. That may seem long, but think about this: its year is only 88 Earth days long! That's because it orbits very close to the Sun. There's a twist, however. Mercury is gravitationally locked with the Sun in such a way that it rotates three times on its axis for every two times it goes around the Sun. If people could live on Mercury, they'd experience one full day (sunrise to sunrise) every two Mercurian years. Planet Venus spins so slowly on its axis that one day on the planet lasts nearly 243 Earth days. Because it's closer to the Sun than Earth is, the planet has a 225-day year. So, the day is actually longer than a year, which means that Venus residents would only get to see two sunrises per year. One more fact to remember: Venus spins "backward" on its axis compared to Earth, which means those two yearly sunrises take place in the west and sunsets occur in the east. At 24 hours and 37 minutes, the Mars day length is very similar to Earth's, which is one of the reasons that Mars is often thought of as something of a twin to Earth. Because Mars is farther than Earth from the Sun, however, its year is longer than Earth's at 687 Earth days. When it comes to gas giant worlds, "day length" is a more difficult thing to determine. The outer worlds don't have solid surfaces, although they do have solid cores covered with huge layers of clouds and layers of liquid metallic hydrogen and helium beneath the clouds. On the gas giant planet Jupiter, the equatorial region of the cloud belts rotates at a rate of 9 hours and 56 minutes, while the poles rotate quite a bit faster, at 9 hours and 50 minutes. The "canonical" (that is, commonly accepted") day length on Jupiter is determined by the rotation rate of its magnetic field, which is 9 hours 55 minutes long. Based on measurements of various parts of gas giant Saturn (including its cloud layers and magnetic field) by the Cassini spacecraft, planetary scientists determined that the official length of Saturn's day is 10 hours and 33 minutes. Uranus is a weird world in many ways. The most unusual thing about Uranus is that it's tipped over on its side, and "rolls" around the Sun on its side. That means one axis or the other is pointed at the Sun during part of 84-year-long orbit. The planet does rotate on its axis once every 17 hours and 14 minutes. The length of day and the length of the Uranian year and the weird axial tilt all combine to give a day that's as long as a season on this planet. The gas giant planet Neptune has a day length of approximately 15 hours. It took scientists a number of years to calculate the rotation rate of this gas giant. They accomplished the task by studying images of the planet as features rotated around in its atmosphere. No spacecraft has visited Neptune since Voyager 2 in 1989, so Neptune's day must be studied from the ground. Dwarf planet Pluto has the longest year of all the known planets (so far), at 248 years. Its day is a lot shorter, but still longer than Earth's, at 6 earth days and 9.5 hours. Pluto is tipped over on its side at an angle of 122 degrees with respect to the Sun. As a result, during part of its year, portions of Pluto's surface are either in continuous daylight or constant night-time. The Earth is the only planet with an approximately 24-hour day. Jupiter has the shortest day of all the planets. A day on Jupiter lasts only 9 hours and 55 minutes. Venus has the longest day of all the planets. A day on Venus lasts 243 Earth days.